Win this app August 9, 2015! I am excited today to be reviewing the MathBoard app! I struggled with math as a child. It always seemed to take a little longer for me than my other fellow peers to fully understand the concepts. Math classes move pretty quickly and so I was often behind. I know many adults, and children have had the same experience. What I love about this app is the ability to customize it for the student or child and allow them to take the time to learn the concepts completely. I also love that while it is a drill app, they are not your average drills. The child will find a fun scratchboard area to work out the problems. There is no rush but they can be timed if that custom option is chosen. It is also fun and a little more creative because they can choose from multiple colors to write with and the chalkboard surface is pretty cool. The problem solver steps the child through each problem they are struggling with and in turn, it helps teach the child the math concepts so they can move forward. MathBoard has been featured on NBC Today. It is an incredible learning tool. It was developed by Pala Software. 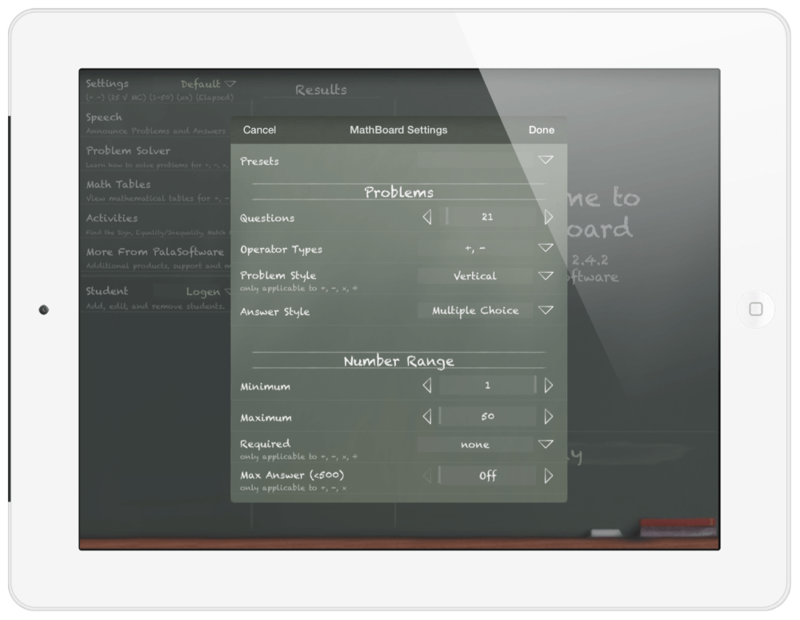 They also have many other MathBoard apps to further the child’s knowledge as well as other apps that are similar in their strategies and techniques. To get started, you will open the app and create a profile for the child or student. You will write their name and set up any customized settings before beginning the game. Once you have set everything up, you will press “play”. The set up can be a little bit confusing. It’s a well built and well designed app but there are a lot of options and so my suggestion would be to download the free user manual . It helps you get the most out of the program and understand completely how to use it. You will want to fully customize it for the child. You can choose the level of difficulty by only allowing a certain amount of digits in a problem, a specific amount of problems in a quiz, and by limiting the types of problems shown. Once you start, you will be brought to a work area with problem drills and quizzes. There can be no time limit or you can choose to time the quiz and activities depending on the needs of the child. The work board is brilliantly set up. A 1/3 of the screen is devoted to the current math problem, another 1/3 of the screen shows how many questions there are as well as how many have been correct! The last third of the screen offers a scratch board area to work out the problems. You can make the scratch board full screen or half screen by pulling the edge of the board over. You can configure the screen for your needs which I love. When testing out the app, I preferred to drag the scratch board over into full screen most of the time. I would refer back to the problem after I found the answer but I liked the space to work out the problems. It also limited distractions. For others that need to see everything at once, they can easily make that work. The child can choose different colors of chalk including: white, pink, yellow, orange, blue, or green. They can erase parts of the screen or wipe the screen completely. To make it even more fun, I wish you could change the chalkboard background color as well. Drawing on a pink chalkboard would be a fun way to add some excitement. It would also get more kids excited about personalizing their board. When introducing the app to a student, it might be good to start with one of their 3 activities. The activities include: Find the Sign, Equality/Inequality, and Match Math. I played all three and found them all effective. I think my least favorite was Match Math because it is mostly luck at first to match the correct problem with the answer. What is neat about the activities is that they are still adapted to your child’s level and needs. 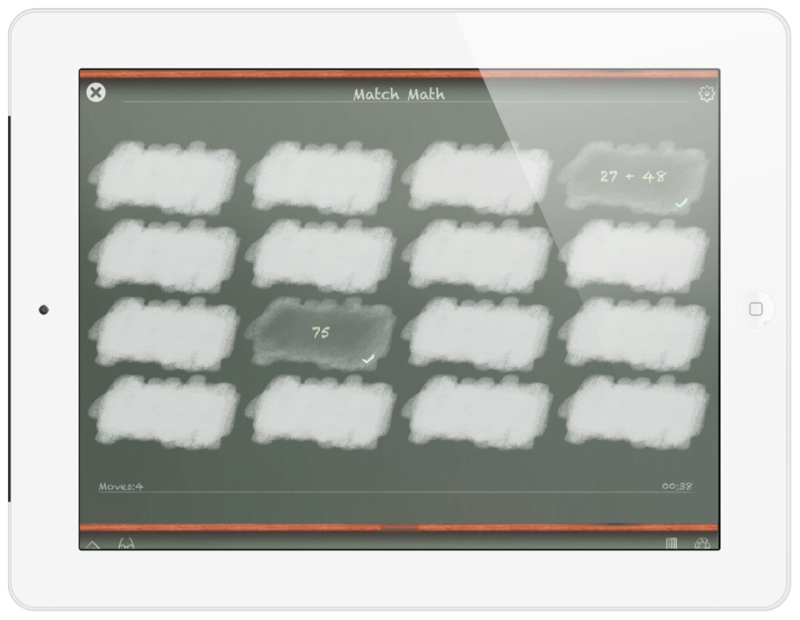 The student’s level of difficulty in the game will be based on the students’ knowledge. The customizable options in this app feel endless! You truly have a large number of choices when it comes to learning and processing the information. Some of the noteworthy ones to set up are: how many problems to drill at a time, the answer style (multiple choice, fill in the blank, etc), whether you want the problem to be vertical or horizontal, the number range for math problems, whether to allow negative answers, whether to solve the solution, the first number, or the second number in the problem, and if to turn sound effects on or off. You can also choose which kind of speech to use for the problems. For example, if your son doesn’t understand what “subtract” means, you can use “minus” instead. It will actually read the problem to the child saying “four minus three”. One great feature in this app is the ability to save the results for each child to view later. This is perfect for teachers, parents, and tutors to know where the child is at and to be able to track progress. Probably the most brilliant part of this app in my opinion is the problem solver. How many times have you sat through a math class thinking you understand the concept but when you got home to do the homework, you had forgotten certain steps? The problem solver gives you a step by step journey through the problem. It allows you to see a full tutorial on how to get to the answer. It’s also very visual and so it allows you to watch how the problem is solved. There are many options that I haven’t even listed! It is definitely worth checking out and would be a great addition to a classroom or home setting. Overall I am very impressed with this app and I do think it will help a lot of kids. The app is interesting, completely customizable, and jam packed with ideas and teaching methods to help and support the student or child. Teachers and parents will appreciate this app for how it can adapt! I would recommend this app for kids between the ages of 6-11 years of age. I also see this app being a huge support for children with autism spectrum disorders, learning disorders, or those that are behind in math. Educators and teachers will like this app because you can create customized profiles for different students. Teachers can allow the child to work through each problem and parents can help them at home without having to know how to teach them. The problem solver and the customizable options are definitely my favorite part. I wish there were a few more activities available to get the child excited but overall, I was impressed. Be sure to check out the Touch Autism Facebook page for weekly app giveaways. 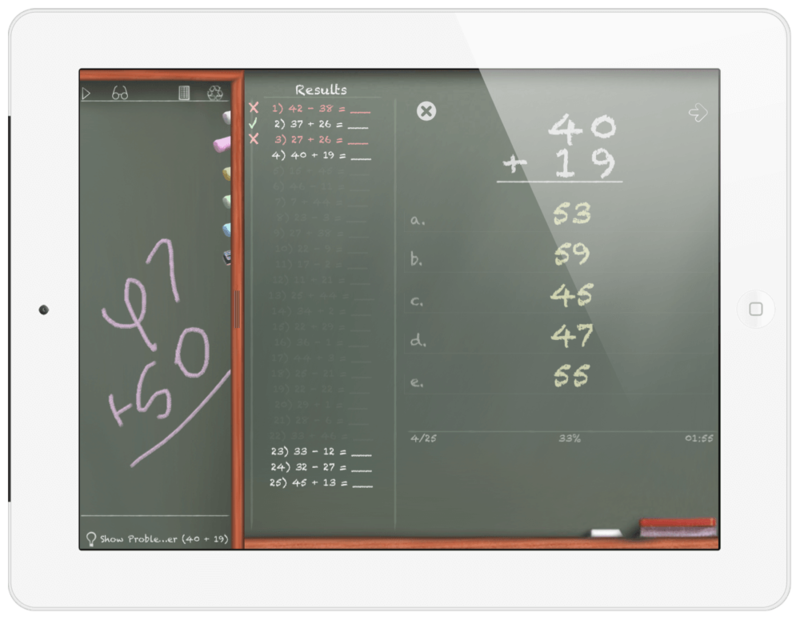 The MathBoard giveaway will be starting Wednesday August 4th, – August 9th, 2015. A comprehensive math app that helps children from kindergarten through elementary school with addition, subtraction, multiplication, and division. 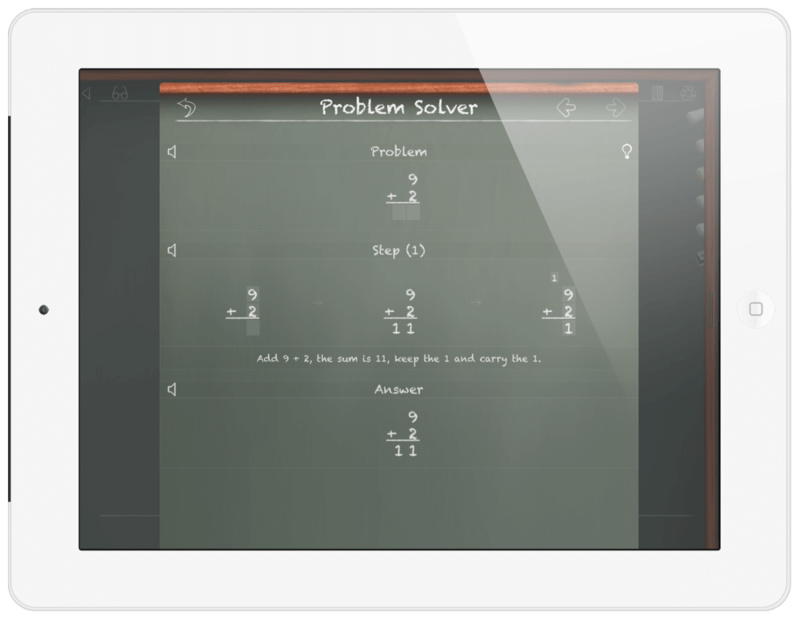 It is customizable and full of great features that will make it easier for them to learn and truly understand math concepts.